A mate of mine had a hard time posting a comment, so I'm adding it here. I have just looked at the report and question the reliability of the results when a BI vendor who appears in the leading quadrant is described by customers as having unreliable, buggy software; poor customer support; below average functionality compared to other vendors. On a positive Gartner says that they sell a lot of product. 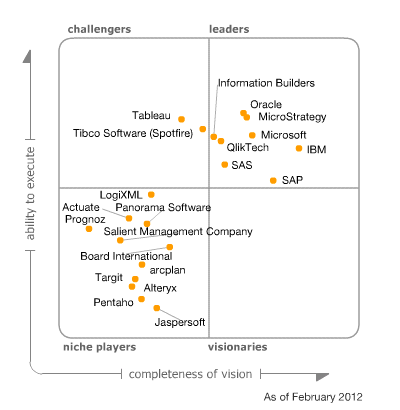 If this vendor has been classified as a leader I wonder what a vendor would need to do to appear in a lower quadrant. I'm not really sure if this quadrant is meant to justify your next software purchase or your last one.